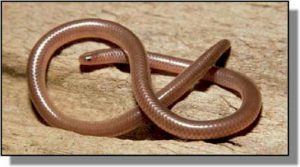 Kansas Range map for the New Mexico Blind Snake. Range: Found in southwestern Kansas in the counties that border Oklahoma, from Sumner County in the east to Morton County in the west; also known from southeastern Kiowa County. Description: Harmless. A small, delicate serpent with dysfunctional eyes. Smooth scales. Uniform pinkish tan above and below. Only snake in Kansas with belly scales that are identical in size to rest of body scales. Tail very short and blunt. Young look like miniature adults. Habits: Spends its entire life below ground; occasionally emerges on ground surface after being washed out by heavy rain. Can sometimes be located by lifting large rocks. Breeding probably occurs in spring but is less dependent than other snakes on temperature and rainfall because it lives beneath the surface. Up to six eggs are laid in cavities up to 30 inches below ground. Never bites. Feeds on ant eggs and termites.